Welcome to the Member News Board. This program was specifically set-up for the members of INDA. 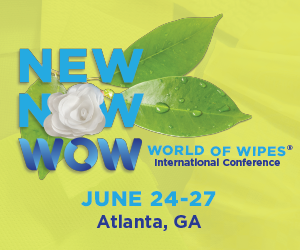 The sole purpose of the program is for our members to share their press releases with the nonwovens industry. Please read through INDA’s Antitrust Policy before submitting your press release. Press releases that violate our policy will not be posted. Once your press release is submitted, it will be reviewed within two business days and either be approved or declined. If it is declined, INDA will notify you as to the reason. If it is approved, your press release will be posted on our website. (optional) These images will appear at the bottom of your Press Release text. Each image can be max. 300x300 pixels. Fill in your contact info here. This information won't be posted on the article.